According to the seller, LA Vintage Gear, this guitar is in good shape with no lacquer crazing or checking, which is remarkable for an instrument of this age. Nitrocellulose finishes are sensitive to temperature changes and will develop a patina of small checks when subjected to sudden temperature fluctuations. Gibson's ES125 full hollowbody was a budget line guitar that proved extremely popular in the early '50s. 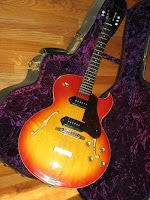 The ES125T non-cutaway soon followed in 1956 -- the 'T' denoting Gibson's thin hollowbody construction. The thin body was more resistant to feedback at higher volumes than a full-hollowbody instrument. Production of the ES125TDC began in 1960, following the highly successful ES125T and ES125TC. 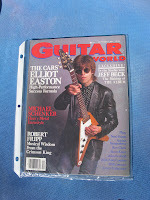 The ES125TDC -- T (thin hollowbody), D (double P90 pickups), C (cutaway) -- like its predecessors, was a runaway success. Despite its popularity, Gibson decided to discontinue the entire ES125 line in 1971. Mike's guitar comes with a custom Cedar Creek case. I'm really digging the luxuriant, royal purple lining! Mike really seems to be clearing out his attic. Check out these other listings for Mike's '79 Fender Precision bass and GT500 Goldtone banjo. 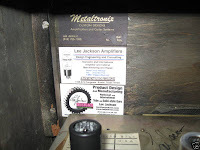 According to the seller LA Vintage Gear (a 100% positive feedback seller I might add), this amp is in pristine condition despite being more than 40 years old. 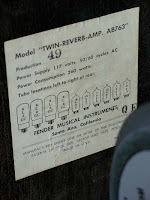 Conspicuously absent are any traces of rust anywhere on the amp. 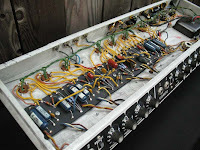 Reworked by custom amp builder Roy Blankenship of Blankenship Amps, only the old capacitors and resistors were replaced. 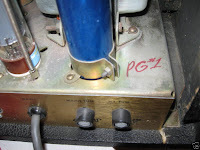 Those things do 'brittle out' or leak, as is common in amps this age. The only other modification is that the original Jensen speakers have been replaced with Celestion Rola G12-65's, which appear to be the newer reissues. Bell Custom Guitars recently announced their new SS Series. Built around the same innovative fusion of wood and acrylic as its more expensive siblings, the SS Series features flat, non-contoured bodies and standard 'vintage' humbuckers instead of the hand-wound Amalfitano pickups. According to the company's website, the flat bodies offer a considerable cost-savings in labour which the company is glad to pass along to the customer. The SS Series is currently being offered in three set-neck models with acrylic wings -- the SS-E and SS-ER are both Explorer-shapes with a maple-centre and mahogany-center respectively, while the SS-V has a maple-center. Now about those acrylic wings. Fusing man-made materials and wood in guitar building is nothing new -- Dan Armstrong and Ned Steinberger have tried it in the past with varying degrees of success. 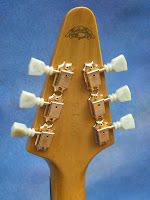 These instruments were either graphite necks bolted to wooden bodies, or wooden necks grafted to Lucite/acrylic bodies. Even MusicMan jumped on the 'space-age' materials bandwagon once with a limited-run graphite-necked variation of their famed Stingray bass. But Bell takes a slightly different approach. Leaving the 'tone' part of the guitar intact -- the strings resonate on a wood neck set into a wood body center-block where the bridge and pickups are also mounted -- the acrylic wings serve only to absorb some of the random resonant frequencies you would find in an all-wood guitar, focusing and compressing the tone. And at the considerably reduced prices of the SS Series, a Bell guitar is now well within reach of most musicians who might be considering trying something new. Are you feeling it? 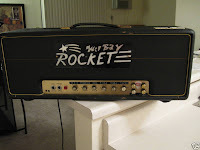 This Flying V sports serial number 0015 (indicating an instrument production number of 15?) 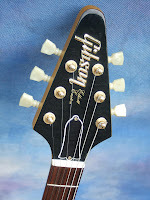 and Easton's name silkscreened onto the face of the headstock. 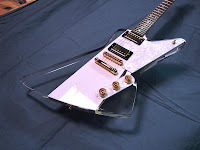 According to the seller this was the only lefty korina Flying V ever made. As a left-hander, Easton has had his share of difficulties as far as procuring instruments. In an interview in 1986, he said, "I can't walk into a store to try the latest thing. So, being in the position that I'm in, sometimes I just call up the maker and introduce myself. Of course, they are usually glad to make something for me, but they usually want something for it. Where another guy could go into a store and pick up a guitar and go, "Nah, that's not really for me," sometimes I end up having to buy it. Then I decide that it's not for me, and I get rid of it." 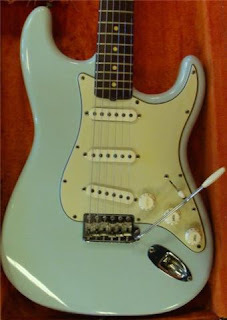 "A lefty was never able to walk into a store and find a seafoam green, maple-neck, gold-hardware Strat. He'd be happy as hell if he found a sunburst one with a little bit of a flip in the neck that he had to fix. The fun now is having the same advantages as a righty person as far as having what I want built for me. 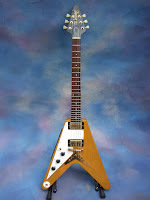 Now I've got a korina Flying V, a korina Explorer, blonde ES-335s, J200s, Guilds. Most of my guitars are one-off. They are almost all handmade, so while they are making a one-of-a-kind anyway, I can slip in little things like, "Well, how about my name here?" or "How about my lucky number 33 on the truss-rod cover?" They've got to make each part and flip over the jigs and stuff, so I can get into it with them and have a little fun." 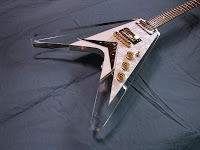 Check Out More Gibson Flying V's Here! Last night the trio of Scott Henderson, Jeff Berlin and Dennis Chambers hit our shores, playing to a small but appreciative crowd of fusion fans. I’ve watched Scott Henderson’s career closely from the time he was with Jeff Berlin and Vox Humana, Chick Corea’s Elektrik Band, Jean-Luc Ponty, Zawinul Syndicate, on through Tribal Tech and up to his blues guitar forays of the last 15 years or so. But the Scott Henderson I witnessed last night was a re-invented revelation. Playing with a fury and controlled abandon rivaling vintage Jeff Beck, he propelled the band through Miles Davis’ All Blues, Billy Cobham’s Stratus, Wayne Shorter’s Fee-Fi-Fo-Fum and Coltrane’s Giant Steps in addition to the trio’s original tunes. I reckon playing all that soul-baring blues for so many years has rubbed off on his fusion style as well. 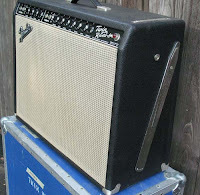 Henderson played a seafoam green Suhr strat equipped with three Fletcher/Landau single-coils into a Suhr SH100 amp and a Boss SE70 multi-effects unit for a stereo split into two rented Marshall 4x12 cabinets. Henderson also seemed to have developed a new-found relationship with the whammy bar, using it to bend up to and from notes, giving his playing a soaring, almost vocal quality -- in fact the bar rarely left his picking hand for most of the two-hour long set. And I should mention that despite his vigorous use of the whammy bar, his Suhr guitar hardly went out of tune, requiring only minor tweaks between songs. And I also learned something invaluable from bassist Jeff Berlin last night. He could play a cascade of notes ripping through Giant Steps and have it speak with as much authority as he would playing a simple blues line or a bass chord-melody version of Tears In Heaven (yep, that song), which he pulled off as a beautiful duet with Dennis Chambers. At the center of it all was his impeccable sense of time -- the structural foundation of his playing. And here's guy who eschews practicing with a metronome..
“A rock bass player was about to spank his son when his wife intervenes. “Why are you spanking your son?”, she asks. The tone of Berlin’s voice is low, almost serious. Berlin allows it to sink in, allowing the audience to soak it up. “So why don’t you just retune it?” she asks. At the absolute perfect moment, he delivers the punchline like Joe Frazier flooring an opponent. Jeff Berlin could easily carve out a career in stand-up comedy. And I mean that in the most respectful way. He has got to be one of the most engaging human beings alive. After the show, when most of the fans had left, I could only put in about 5 minutes with Scott Henderson. I actually had a bunch of questions I had put together, on the off-chance that I would be able to interview him for this article. He looked really tired. And no matter how great your sidemen are, the guitar player in a trio format always has to go the extra mile or three to make things interesting. I told him about how I had seen him play at La Ve Lee’s with Dave Carpenter, Scott Kinsey and Joe LaBarbara in 1998. Scott talked about the closing of that club due to a structural defect in the building’s roof. I could tell he missed the place, having held a weekly residency there for a number of years. La Ve Lee had become the ultimate musician's hang for LA's session elite as well as for the many GIT students that passed through year after year. And he grew somber when he mentioned bassist Dave Carpenter’s passing in 2008. It wasn’t long before the trio was hustled back into the empty auditorium by the organizers and out the backstage door where their transport back to their hotel awaited. Kudos to Heads Up for pulling this gig together! Buy Scott Henderson CDs and DVDs Here! Born 18th October 1926, Charles Edward Anderson 'Chuck' Berry's career started in the early 50's with an informal group he had put together with pianist Johnny Johnson and drummer Ebby Harding. Playing at neighbourhood parties and barbeques, Berry held a day-job as a hairdresser to support his wife and two children. It was a trip to Chicago and a chance meeting with blues legend Muddy Waters that led him to Leonard Chess. Seeing that Chess Records was a blues label, Berry put together a demo with a slow blues he called 'Wee Wee Hours'. But it was the other tune on his demo, 'Maybelline', that caught Leonard Chess' ear. Chess immediately recognized the radio airplay potential of Berry's highly original brand of raucous rock 'n roll. 'Maybelline' became Chuck's breakout hit. It also changed the course of Chess Records, transforming it from a small blues label to a hugely successful rock 'n roll corporate machine. More importantly, 'Maybelline' became the unifying anthem that reached out to both black and white audiences -- something unheard of in 1955 -- establishing rock 'n roll as a genre that transcended long-held social and cultural barriers. Chuck Berry had single-handedly paved the way for the likes of Little Richard, Carl Perkins, Gene Vincent, Jerry Lee Lewis and Elvis Presley. Check Out More Chuck Berry CDs Here!